Lighten up your polenta with cauliflower! 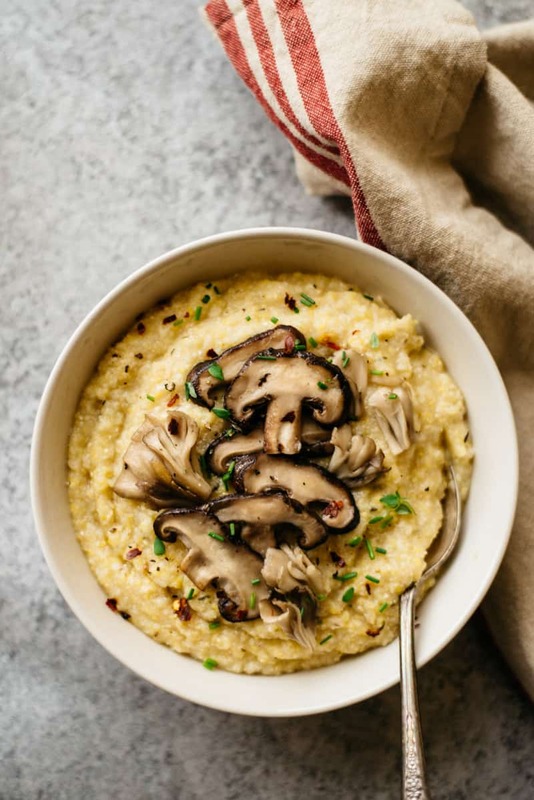 This cauliflower polenta is made with cauliflower rice and topped with sautéed shiitake and maritake mushrooms. If the Japanese mushrooms are difficult to find, feel free to substitute them with any other mushroom variety. 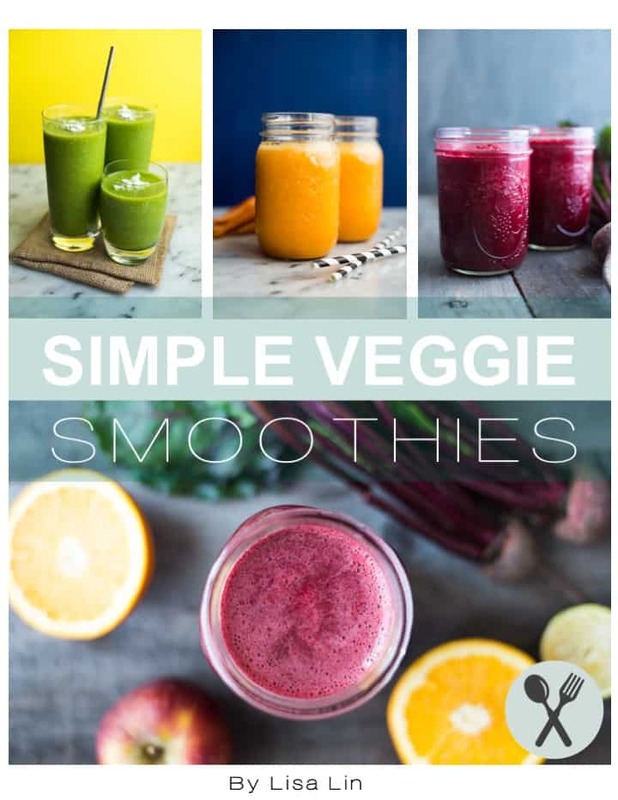 If you’ve poked around this blog before, you’ll know that I pretty much shove vegetables into my dinners wherever I can. (See butternut squash mac & cheese, pesto pasta with zucchini noodles and cauliflower fried rice.) It’s the only way that my husband will eat his vegetables, I swear. Well, this cauliflower polenta is another prime example of my cooking philosophy. Despite the pound of cauliflower that I added to the recipe, the cauliflower flavors don’t overwhelm the polenta. The melted butter and cheese add richness and help make the dish taste like a proper polenta. I suppose a tiny bit of butter and cheese can fix anything! Mushrooms are in season right now, so I paired the cauliflower polenta with some sautéed shiitake and maitake mushrooms. These mushrooms have great flavors that can stand out on their own. If these mushroom varietals are not easy for you to find, the good ‘ol cremini mushrooms will work well in this dish, too. Rice the cauliflower in batches: Resist the urge to just throw all the florets into a food processor and blitz everything together. You’ll probably end up overcrowding the bowl and have a couple of large chunks of cauliflower that won’t break down. Leftovers: Because there’s a lot of cauliflower in this recipe, you might notice some water building up in your leftovers. I usually just drain the liquid. Vegan option: Leave out the cheese and use vegan buttery spread instead of regular butter. This dish is great with your choice of protein, such as tofu or chicken. If the Japanese mushrooms are difficult to find, feel free to substitute them with any other mushroom variety. Adapted from Cooking Light. Cut cauliflower into florets. Working in batches, add florets into a food processor and blitz until you get fine cauliflower rice. Heat the olive oil in a large pan over medium-high heat. Add the minced garlic and let that cook for about 30 seconds to release the fragrance. Next, add the cauliflower rice and cook for about 2 minutes, stirring frequently. Add the cornmeal and the vegetable broth and stir to mix everything together. Reduce the heat to medium-low and let everything simmer for about 20 minutes. If you find that all the liquids have evaporated before the cornmeal looks softened, add water, about 1/2 cup at a time and stir to distribute the water. Add the thyme, porcini mushroom powder, butter, cheese and salt and stir until the ingredients have melted. Turn off the heat and cover the pan with a lid while you cook the mushrooms. The cornmeal will continue to absorb all the liquids. Heat 1 tablespoon of olive oil in a separate pan. Add sliced mushrooms and cook for 4 to 5 minutes, stirring frequently. Sprinkle a small pinch of salt on top. 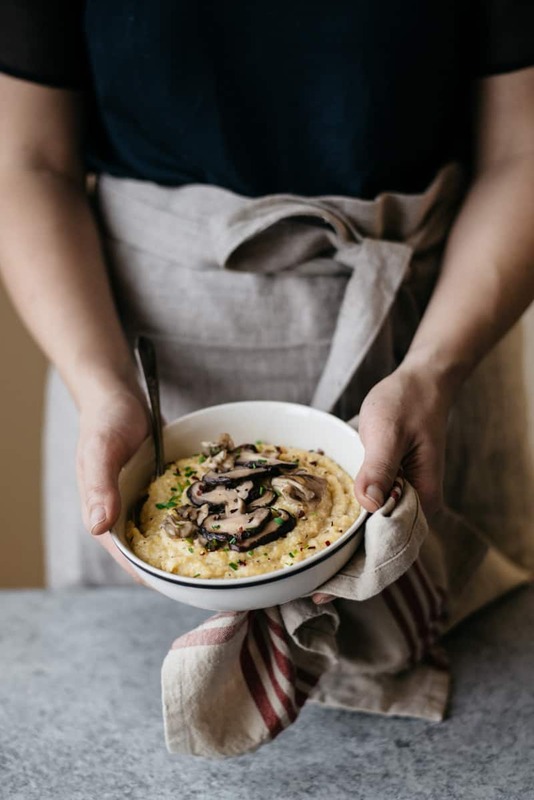 Dish up cauliflower polenta into bowls and top with some mushrooms. Sprinkle some chives, red pepper flakes and ground pepper on top. Serve immediately. *If you are making this recipe from a head of cauliflower (versus packaged cauliflower florets), you will want a head that is slightly over a pound. After you pick out the leaves and chop out that center core (or stem), you should get about a pound of florets. **I wanted to give this dish more umami flavor, so I added 1/2 teaspoon of porcini mushroom powder in there. Essentially, it’s dried porcini mushrooms that I ground into a powder with a coffee grinder. If you like the video, I would love it if you could give it a thumbs up on YouTube! For the latest updates, subscribe to my YouTube channel. 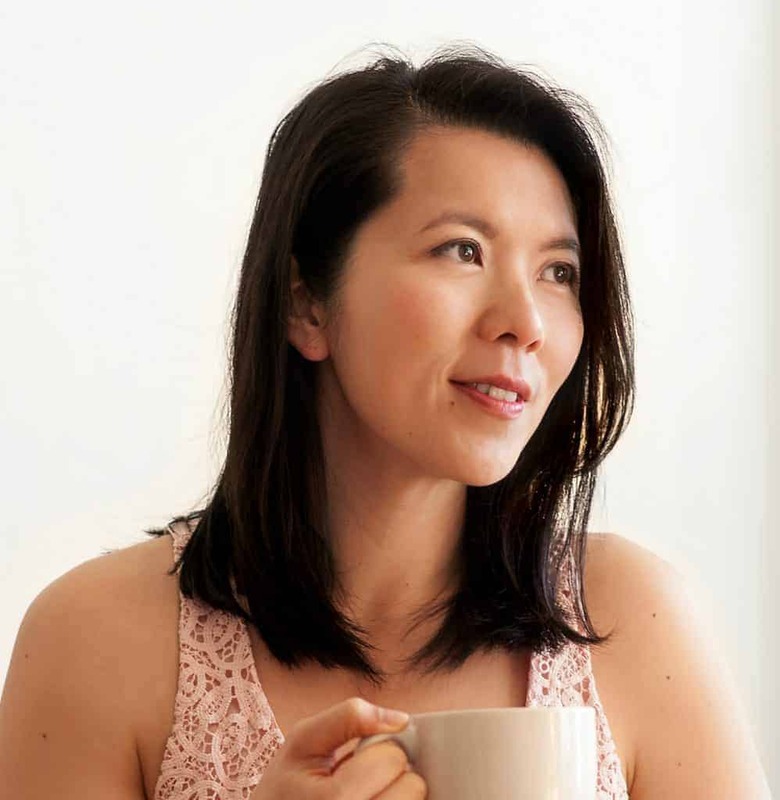 Lisa; Looks really delish and love the idea of cauliflower rice with cornmeal. Will try this soon myself. Thanks, Marinka! Hope you enjoy it! Love the sound of this cauliflower polenta Lisa! So creative and different! yum! this looks simple and hearty; bookmarking it as a weeknight recipe! i like that you didn’t leave the grits out, just made it a mix with the cauliflower! i’ve made caul rice risotto on it’s own, and i thought it needed a little more heft so this is perfect. and mushroom love! This is such a gorgeous bowl Lisa. 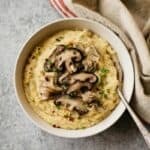 I would have never thought to mix polenta with cauliflower, but from reading the recipe and looking at the photos I am so intrigued. It is like a bowl of umami goodness. Thank you so much! Please let me know if you do cook it! 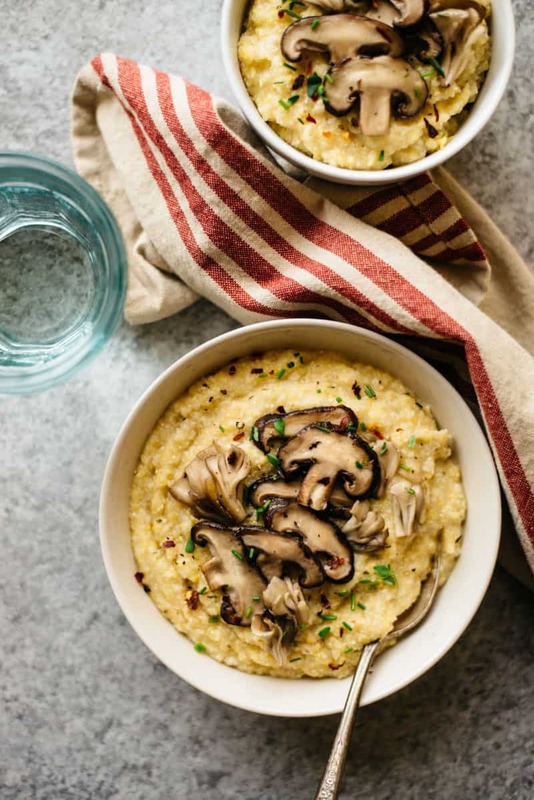 Love the idea of lightening up polenta with cauliflower! Have you ever tried polenta with buckwheat flour mixed in? It is a specialty of the Italian Alps. I love it! It is even tastier and definitely more nutritious. I’ll try it with your recipe! I have never tried that before, but I definitely want to give that a try now! Thanks for the suggestion, Valentina! All my favorites in one bowl! This is such a great combination of flavors – sneaking in that cauliflower is genius! Lovely, Lisa! I can’t even image how amazing this must smell when cooking. Love it!! Hi there! This was my first recipe I tried from your site and I had so much fun making this dish! I will say, my efforts were minimized a bit thanks to Trader Joe’s selling riced cauliflower in a perfectly portioned 16 oz. bag (always love when I don’t have to pull out the processor). The one issue I ran into was the addition of the porcini mushroom powder and dried thyme—the instructions don’t say when to add these two ingredients. I used my best judgement and added the mushroom powder to the polenta at the beginning of cooking, and then added the thyme when I added the butter and cheese (I used parmesan because I had it on hand—yum!). Not sure if that was right, but it seemed to turn out just fine. This dish was much more hearty than I expected! And very delicious. Thanks for a great recipe. Natalie, first of all, thank you so much for taking the time to try out my recipe and for letting me know how it turned out!! I’m glad you enjoyed it. Also, thank you SO MUCH for letting me know that I left out the mushroom powder and the thyme. You cooked it perfectly. Thank you! Hi! I am on a low carb diet and this look AMAZING! But I was wondering if you had any suggestions, if there are any, on a substitute for cornmeal? Hi, Victoria. You can just double up on the cauliflower and the recipe should work as is. You might need to adjust the seasonings a little, but I think it will work. Let me know how it goes! Okay great. Thank you so much! I’ll let you know when I try it! First time making polenta. Can I freeze this? If not can you tell me how long it will last in the refrigerator? Hi, Barbara! I’ve never tried freezing it, but I think it could work. This polenta might be a bit runny when you reheat it because of the high cauliflower content. If you are okay with that, then go ahead and freeze it. I would keep this in the fridge for no more than 4 to 5 days. Delicious. Deglazed the mushroom pan with red wine and then poured that reduction over the mushrooms. Substituted vegan butter and vegan parm cheese. The mushrooms needed more salt than in the recipe. Also added 1 T of nutritional yeast to each serving, which was amazing. Really tasty and satisfying. Joy, thank you very much for trying out my recipe! I’m so glad you enjoyed it!